My shack continues to be in a state of flux, Nothing is built just once. As I rethink things, stuff is added or changed. In this case I decided to pair my 6J5/6L6 transmitter up with my HRO Sr rather than my Simple Superhet. I wanted something of the right design vintage and looks to sit next to my HRO while running either barefoot or driving my TZ-20 amp. 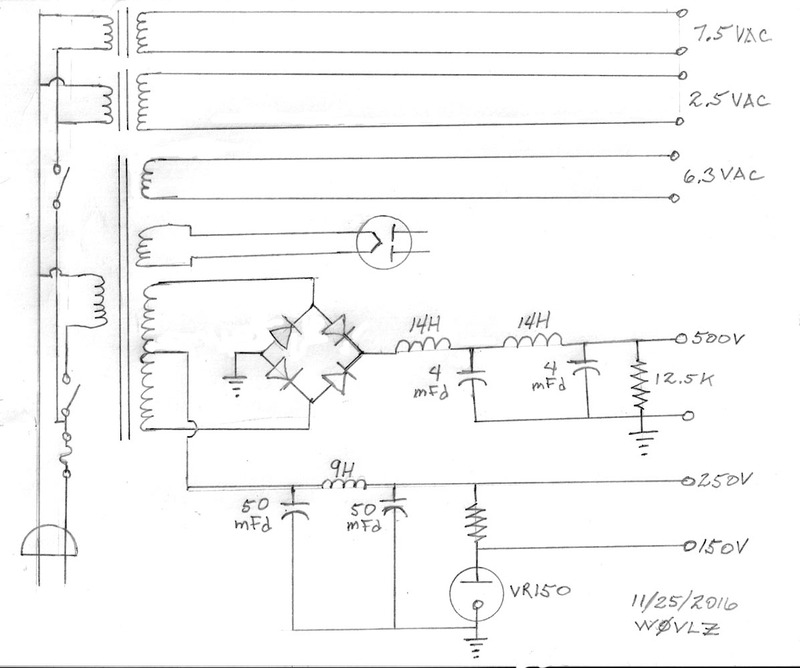 The core design of my 6J5/6L6 transmitter is right out of a 1940 Stancor manual so the design was fine. It just didn't look like it belonged with the HRO Sr. What I did was a cosmetic change replacing the front panel and then repackaging the transmitter in a metal cabinet. If I ever need a more upscale transmitter in that spot I have a Meissner Signal Shifter waiting in the wings. Many identify the Novice Class between 1951 (when it was introduced) and the early 70s (when VFOs, 250 watts and renewable licenses became part of the novice license) as the golden or classic era for novices. During the 50s and 60s the novice class was clearly a learner class. During this time amateur radio manufacturers marketed rigs specifically designed for novices. Novice Class. Hallicrafters chose the add a crystal oscillator to a S38B along with circuitry using the 50L6 audio amp as the transmitter final. The resulting rig looks, from the front, almost exactly like a S38B. Performance and usability would have been disappointing.The transmitter was only rated for 10 watts and changing bands or the crystal required removing the back of this AC/DC set. Also the SR75 receiver section was basically a S38B, an entry level receiver that many beginners would already have had. 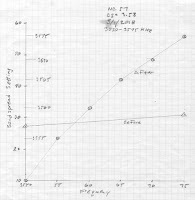 In addition the price delta between the S38B and SR75 was $40. Several crystal controlled transmitters were on the market in the early fifties in this price range that would have looked better to the novice and he could build his own transmitter even cheaper. By the time Heathkit tackled this particular niche in the mid 60s they designed a rig from the ground up that had features better tuned for the novice. Two bookends on an era but Heathkit did a better job. I'm using my HW16 while the SR75 remains a shelf queen good for discussion. I've six stations that I should have on the air for these events. These will all be a great activities for those long cold Minnesota nights I'm expecting. As I was looking for more information about my NC-81X I found the Western Historic Radio Museum. This is a great resource providing all sorts of interesting information and restoration tips. I've gotten my NC-81X back on the air! It is paired with my Stancor 10P for a mid-class 1939 AM/CW station. I'm using it on 40 and 80 meter CW. The NC-81X sat in the National receiver price lineup below the NC-101XA. Comparing the two, the NC-81X had transformerless AC/DC power, no S-Meter and no RF stage but I found it really performs pretty good. Shifting the IF to 1560KC helped eliminate any image problem. Along the way to adding it to my station lineup I did change a few things. First the obvious one, I changed out all of the paper and electrolytic caps. I left the original electrolytics in place but replaced them with modern electrolytics mounted under the chassis. I'm not a fan of transformerless AC/DC receivers and this one had a short between the chassis and the metal case. 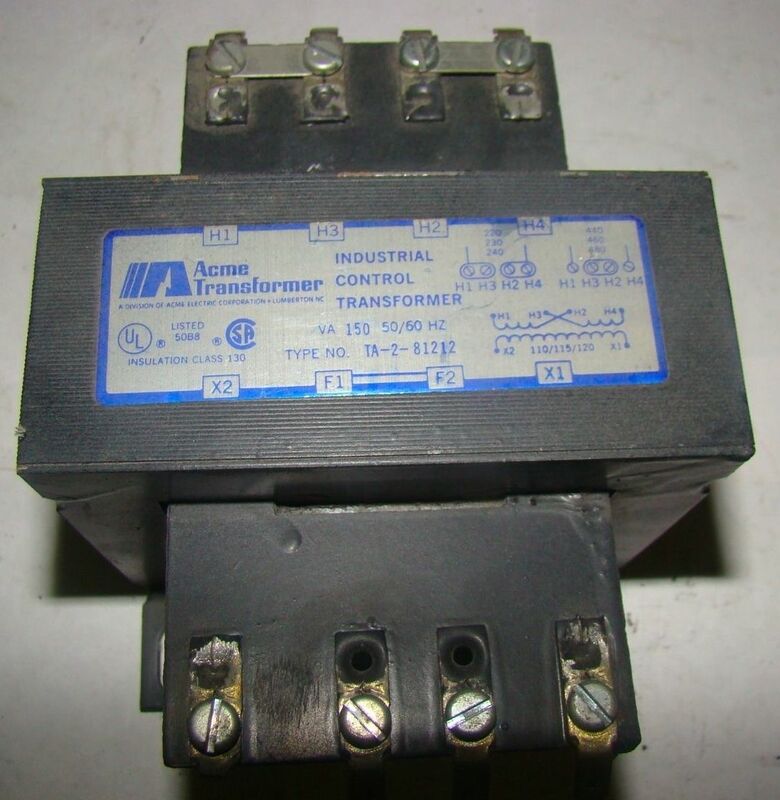 Unless run with an isolation transformer it was a shock hazard waiting to happen. I had a small isolation transformer big enough to handle the NC-81X B+ requirements so I wired it into the receiver to supply B+ and I left the filament string connected across 120 VAC. I addition I fused each side of the AC line and added a three wire/grounded cord. Now this radio is safe to use but repair work under the chassis still requires a "real" isolation transformer. The NC-81X is not an HRO though. While very usable it still tends to FM/wobble on strong CW signals. I suspect the B+ needs to be regulated. 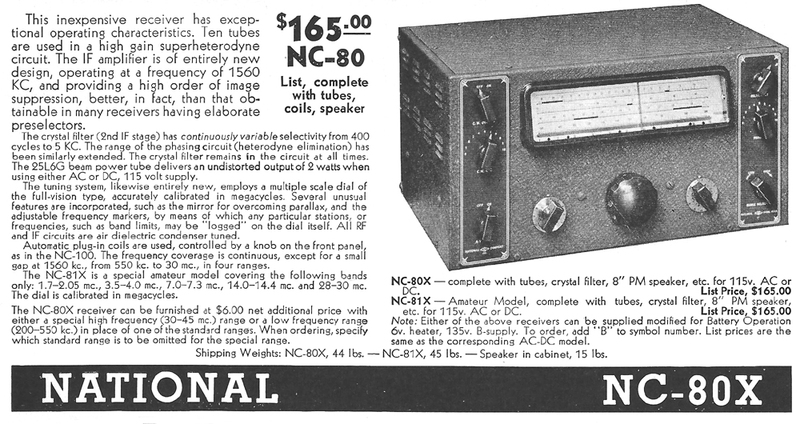 The 1938 list price for the NC-81X was $165 while the NC-101X listed for $215. This was back when the US average wages per year was $1,730 compared to about $60,000 today. I bet 10% of my wages towards a new radio would lead to some interesting dinner time conversation. 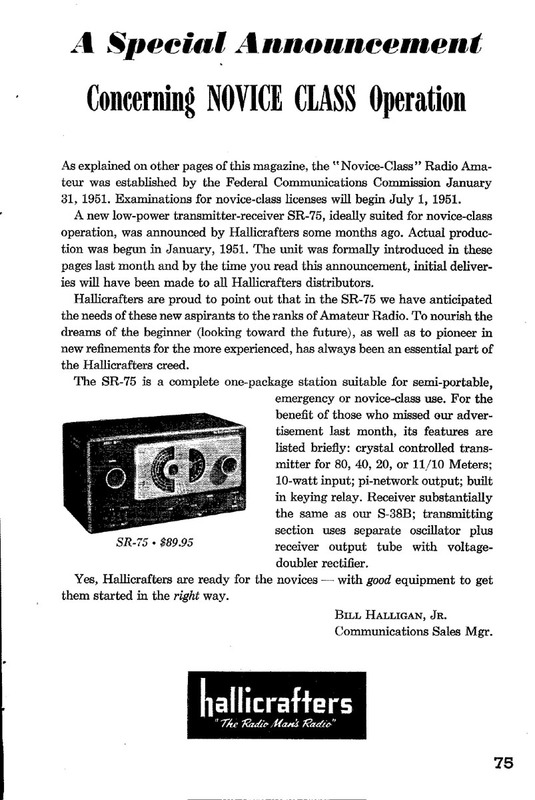 No wonder National introduced the NC-44 at an even lower price point ($82.50) and by 1939 dealers sold these radios at a very steep discount (NC-101X for $129 and NC-81X for $99). AM or 20 watts CW on 160-10 mtrs. It should be a fun rig to have on the air. Now's the time to assess what I have and decide what needs to be done. Both the front and top views show this rig to be unmodified. Excellent. I'm always sorry to see an other wise neat radio suffering from Black and Decker Syndrome. But what's been done under the chassis? Connections hanging in mid-air? 6.3 VAC filament voltage run to the crystal socket (maybe for a VFO connection)? But everything important seems to be there so it looks like the first step will be to strip the chassis down to stock parts/layout, next, test the transformers and chokes then replace the electrolytic and paper capacitors. After that I'll see what else needs to be replaced or rewired. One receiver that I like to use as an example of early novice class gear is my National NC-57. 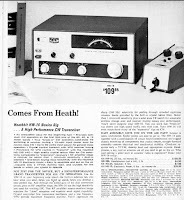 It is a good vintage and performance match for transmitters like the Johnson Adventurer and Heathkit AT-1. Unfortunately, like most two dial sets, the bandspread is designed to cover the entire 500KHz 80 mtr band. The 25 KHz of 80 that I'm most interested cover only 4 divisions (out of 100) on the dial. Bandspread on 40 is little better. I needed to bandspread the bandspread. This modification is reversible and changes those 25 KHz of 80 to cover 45 divisions on the dial instead of 4. Now I have a chance of grabbing the right crystal when answering a CQ and easily tuning in a station with the Q-Multiplier turned on. Basically this change greatly reduces the effective value of the bandspread capacitor. This can be done by removing rotor plates from the bandspread capacitor but a simpler change is to put a low value capacitor in series with each section of the bandspread capacitor. You'll need three 10 pf capacitors. Using a fine tooth hack saw blade carefully cut the three wires between the main and bandspread capacitors. After cutting these three wires your NC-57 should behave normally except it will have no bandspread. Solder three 10 pf capacitors between the main and bandspread capacitors electrically replacing the three wires just cut. That's it electrically but you'll probably also want to make up calibration curves for you favorite parts of the bands. When cutting the three connections between the main tuning and bandspread capacitors there is a chance something will go wrong. You may be able to fix it by running an interconnect jumper across the top (insead of capacitors) or you may have a boat anchor in the nautical sense...sorry. 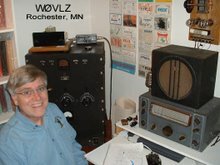 This past weekend was the annual Northland Antique Radio Club (NARC) "Radio Daze" about 90 miles north of me in Plymouth, MN. I try to make this one every year. While the club is more oriented towards broadcast sets, obviously there is a lot of overlap with ham radio boat anchors. I always see several calls in the parking lot and some ham gear shows up in both the Friday night auction and the Saturday parking lot swapmeet. It's been a while so Beth said she'd come along and we would make an over night outing out of it. NARC has close ties with the Pavek Museum of Broadcasting so Radio Daze starts out with a Friday Pavek garage sale. I've picked up a few things at the Pavek before so I joined the crowd queued up at the door waiting for 10AM. This time I was not disappointed. Out for sale was a Millen 90800 transmitter, a Central Electronics 10A SSB transmitter, a McMurdo Silver 801 receiver and a Stancor 10P AM/CW transmitter. I was already familiar with the 10P. Several years ago I had built my own 6J5/6L6 transmitter based on the CW portion of that rig. This one was a no brainer. This nice condition 10P was my Pavek purchase for the day. I'll probably pair it with my NC-81X as an example of a nice entry level 1940 station. Last Friday happened to be a fairly nice day here in Minnesota. We've been waiting for spring here. Beth and I headed over to French Regional Park for a picnic lunch. Beth had reading material and I had my KX3 along. Despite poor conditions I thought I'd try "QRP in the Park". What I found was that I got a lot of 20 mtr hits on the Reverse Beacon Network but most of the hits were pretty weak...no responses to my CQs. I decided to move to 30 mtrs and 10 watts. This, at least, netted a QSO, one with KC5K in SE Texas. The 2018 QRP season is open for me. Given conditions I'll probably rethink my antenna situation, though. Right now it is optimized for 20 and 30. I need to put it on 40 and 30. Friday night was the NARC Radio auction. This one had several Hallicrafters general coverage receivers, a BC348, a Mon-Key code monitor/keyer and a Knightkit T60. While not a lot of ham gear it was still at great place to meet others and talk about radios. Saturday morning's swapmeet was scheduled to start at dawn. I took this to mean start when you don't need a flashlight. At 5:45 two of us, one seller and one buyer were on time. The rest caught up by about 7. Again, mostly broadcast stuff but also good parts and a few pieces of ham gear. I did talk to Roger, KA9BKK. He had a nice looking Ranger I and a Heathkit AT-1 to sell. I have a Ranger already but the AT-1 is a good example of early novice gear. 15 mtrs isn't even on the bandswitch. We worked out a deal and I now have a transmitter that is a good match for my NC-57. I'll have to decide how many of McCoy's Oct 1955 modifications I want to add. Like I said, "It was a very good weekend". As I participated in various radio events this past winter I thought about a safety issue common in budget and homebrew transmitters prior to about 1960. Many, if not most, of these transmitters used cathode keying with no regulation of the screen voltage. In these transmitters it is common to find over 100 volts across the key terminals. I measure 125 VDC at my Johnson Adventurer key terminals. Some of my friends checked their 1929 homebrew transmitters. They found as much as 191 VDC at the key terminals. All of these are basic one or two tube cathode keyed transmitters, the sort of transmitters used by many today to experience vintage tube gear. What can be done about the high voltage at the key terminals? - Keep your fingers off the key terminals: I've been doing this up to now. It usually works but my wife worries that it does not always work. It also follows the "If it hurts don't do it" rule. - Covered Key Terminals: Several military keys and even some bugs are available that hide the terminals. This is a workable low tech solution but you have to find a suitable key or bug. 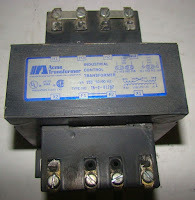 One option today is the Bencher RJ-1 sold by Vibroplex ( http://www.vibroplex.com/contents/en-us/p202.html ). - Mechanical Relay: Use your key or bug to operate a relay that is actually keying the rig. I've never tried this but it appears that speed may be an issue. How well does the relay keep up? - Electronic Isolator/relay: I used a "Keyall HV" from Jackson Harbor Press / WB9KZY. The Keyall HV includes an opto-isolator and MOSFETs rated for 1000V at 3 Amps. Besides low voltage at the key terminals it is also low current so it can be used to interface a modern keyer to the heaviest of our cathode keyed boat anchors. See http://wb9kzy.com/keyallhv.htm for details. The Keyall HV kit includes five parts and a small printed circuit card. This kit is just about as simple as one can get. Instructions are on the Jackson Harbor Press website. I used a small aluminum utility box for my keyall housing. I could have used a smaller box but the only two battery battery holder I had was for type C flashlight batteries. The batteries needed all of the available width. I used a barrier strip for the transmitter connection because some transmitters do not have one side of the key connection grounded. The Keyall HV interface sits in-line between my key and the transmitter. The key terminals now have less than 3 volts between them. The two C cells should be good for over 500 hours of key down time. 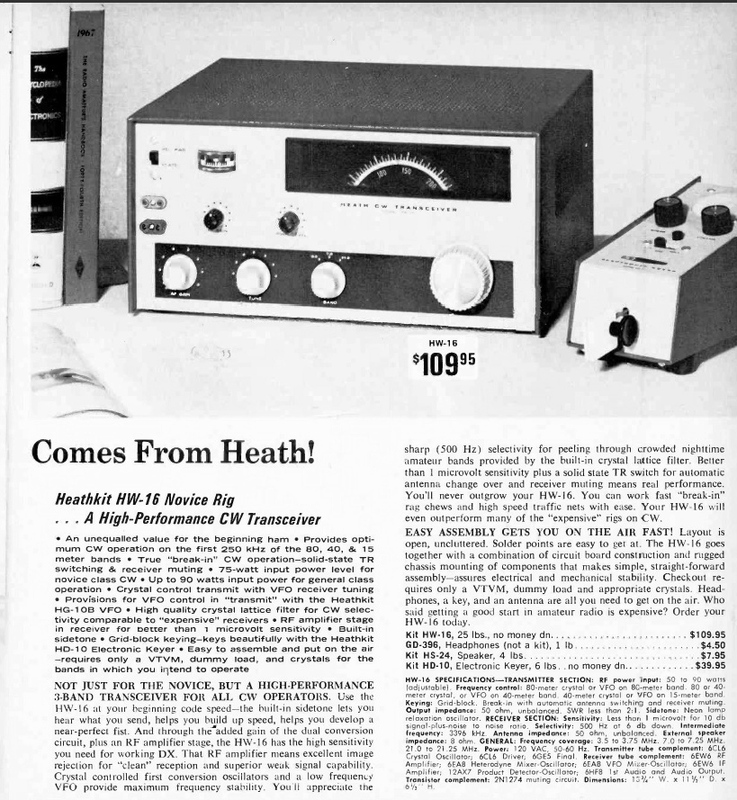 The Heathkit HW-16 was one of the last rigs designed specifically for the US Novice operator. It was marginally a transceiver. The receiver and transmitter sections share a common power supply and antenna coupling circuitry. 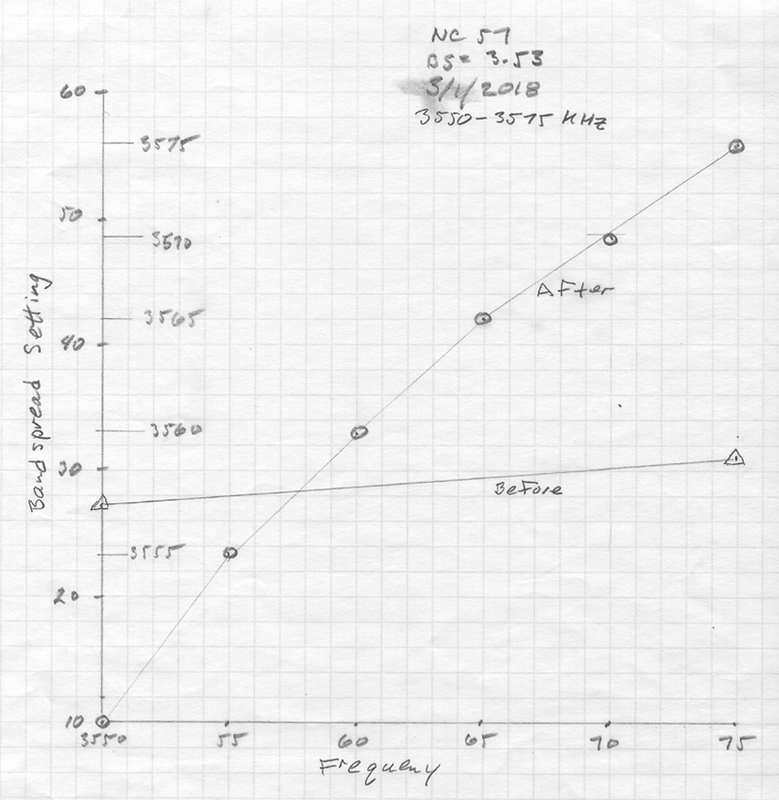 The HW-16 covered only 80, 40 and 15 meters, the bands allowed for Novices in the late 60s. The CW only transmitter ran 75 watts and was crystal controlled, again novice requirements. The receiver section was double conversion with 500Hz selectivity. Good selectivity for the chaotic novice bands was a must. After my initial tuning around the 40 meter band I'm pretty happy. Only 345 +- days to go to the NRR 2019. In the mean time look for me in the evenings around 7110-7120. The 2018 Novice Rig Roundup is now history. During the nine day event I used 4 transmitters and 5 receivers to make 23 contacts in 15 states and British Columbia. Drake 2B and Collins 75A4 with EFJ Adventurer My Adventurer position was set up so that I could easily switch between a Drake 2B and my Collins 75A4. The 75A4 is certainly a fun radio to use. I have a 500Hz crystal filter installed and, with the 75A4 bandpass tuning, I could easily sort signals out. KC frequency readout was great also. The 2B, though, could hold it's own against the 75A4. The only thing I missed on the 2B was KC frequency readout. For pairing with a simple crystal controlled transmitter like the Adventurer the 2B is my choice. NC-57 with a 6AG7 Sucker Stick Xmtr This pair fits both as an NRR Novice 1 station and as an AWA Linc Cundall pre-1950 rig ( http://www.antiquewireless.org/awa-linc-cundall-memorial-cw-contest.html ) I've added a Heathkit QF-1 Q-Multiplier to the NC57 and spread out the bandspread so that 50KC covers most of the dial. It now does a pretty reasonable job on 80 and 40 CW. I just have to ride the RF gain to keep the set from overloading. 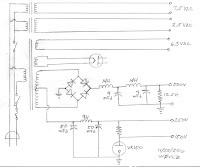 4-5 watts out for the 6AG7 transmitter, while expected and a cool design, makes for a tough time raising QSOs. My plan is never to run up the score but QSOs are still more fun that calling CQ CQ CQ. If I were only thinking of the NRR I'd probably replace the 6AG7 transmitter with my Adventurer, but the Adventurer does not qualify for the AWA Linc Cundall. I need a pre-1950 transmitter. Before next year I'll build up some sort of homebrew transmitter using pre-1950 tubes that runs more power than a single 6AG7. NC-303 / Eico 720 The Eico 720 is my favorite "novice transmitter". I used one 50+ years ago when I was a novice and I like the looks. It has style. Before this year's NRR I replaced the power transformer and did a required tune-up. Now it works without a chirp on all bands. This one is a keeper. The NC303 is a fine late 50s receiver but it has to compete with my Drake 2B as I consider what to use. The 2B is the nicer receiver. Next year my Eico 720 will be paired with my 2B. Drake R4B with matching T4XB Except for my Novice year I've always had a transceiver at the primary operating position. This year for the NRR I ran my vintage Drake B Line separated. This worked great! I had frequency spotting, QSK keying, code monitor plus matching KC readout on both receiver and transmitter. The R4B receiver with variable/tunable bandpass is a great receiver. This is now my go-to rig when my KX3 won't quite do the job and it fits in fine as an NRR "Novice 2" station.